Achampet mandal of Mahabubnagar district, Andhra Pradesh (AP), was in the clutch of drought six years ago. But it is doing well at present. "Satellite images show an improvement of about 300 per cent between February 1994 and March 1998 with regard to the groundwater table," says Ramesh Reddy, head of the department of civil engineering at Osmania University, Hyderabad. He is also the chairperson of the Centre for Rural Youth Development (CRYD), a non-governmental organisation in Achampet. 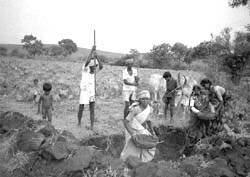 In 1995 the people of this region, along with CRYD, took up the AP Groundwater Borewell Irrigation Scheme, known as APWELL in short. This scheme of the state government was aimed at watershed development to improve groundwater resources and recharge borewells. The scheme was made available in seven drought-affected districts and was a result of an agreement between the state government and the government of the Netherlands to fund watershed development. In 1999-2000, the state faced a severe drought. More than 17 per cent of the habitations in the state face drinking water scarcity, says a May 2000 report by AP's department of rural development. The government responded by putting its various programmes like APWELL into a concerted effort called the Neeru Meeru (Water and You) programme, which is the 12th part of the Janmabhoomi initiative of the of the ap state government. Janmabhoomi translates to motherland in English. Launched in May 2000 at the behest of the ap chief minister, N Chandrababu Naidu, Janmabhoomi aims to create self help groups -- women's groups, water users' associations (WUAs), watershed development committees or youth groups. The message is that people should realise their duty towards the motherland. This is part of an ongoing initiative of the state government to involve communities in their own uplift, as is the idea of creating vana suraksha samitis (vss, or forest protection committees) to protect forests through watershed development. "All these activities were going on individually but there was no impact analysis and individual decisions were giving poor deals to the people," says Chandrasekhar Reddy, special officer in charge of Neeru Meeru with the rural development department. This is exactly where the programme aims to make a difference by involving people in all development activities linked to water. The chief minister told Down To Earth, "Through Neeru Meeru I want to increase the percentage of rainwater we conserve... we are working in so many ways. Whatever the experiences of the many experts working all over the country, I am borrowing all these." As the push for the programme was coming straight from the chief minister, there was hardly any opposition to it within the ruling party and the administration. The Andhra Pradesh government has formed a water conservation mission (WCM). This is a mission consisting of experts on water from various parts of the country. The mission has been formed under the chairperson of the chief minister, Chandra Babu Naidu. As a part of its activities on watershed management the government has already formed 5,260 watershed committees in the state. The principal secretary, department of panchayati raj and rural development have been made responsible to implement the programme. The village level committees have the village sarpanch as president and the village development officer as convenor. The stakeholders are the water users association (WUA), self help groups, village officials, women groups, NGOs and research organisations. The mission also includes providing training, fund, technological assistance to the villagers. But the bureaucracy still drives the entire programme. This top down approach pursued by the state government, however, has given rise to resentment and non-participation amongst the stakeholders due to two major drawbacks. To begin with the process of decentralisation was seen as a means to promote the building of a cadre for the TDP, say experts working on minor irrigation. The village community has to sign a memorandum of understanding (MOU) with the district authorities which gives total control to the bureucracy over what is supposed to be a participatory process. The local community is supposed to look into the aspects of planning; implementation and subsequent management of the watershed project. The MOU also mentions that the village community has to agree to a change in cropping patterns by not using water intensive crops and go in for social fencing. But the scope of participation is subject to strictly adhering to guidelines. Failing this the government reserves the right to convert the money released for the projects into a loan and initiate recovery proceedings. The programme planned for construction and revival of watershed development structures, including checkdams, contour trenches, rock-filled dams and gully bunds. Water harvesting trenches and other such structures are also being constructed in various villages, agricultural lands, temples, urban houses, institutions and open areas. Funds for all this are being provided by multiple agencies. One programme that has received a major fillip is desilting of old tanks, which has been carried out in 3,348 villages, the work being stopped currently due to the monsoon. Contractors' poclains (earth moving machines) extract the silt and farmers bring their tractors to carry the fertile extract to their fields. Desilting by the hour requires the services of 20 tractors. One has to be present next to the poclain every 2-3 minutes as costly machines are rented on an hourly basis. "This is how people were mobilised. They were present at the site with their tractors," says Reddy. Desiltation work has also been undertaken in the many tanks controlled by the Panchayati Raj and minor irrigation's department. The tanks were traditionally under the maintenance of the community. There are about 80,000 tanks in ap whose worth today stands at Rs 50 lakh per tank, says Uma Shankari, convenor of Neeti Samkhya, an NGO based in Chittoor district. They are in poor condition today due to neglect by the government and the people. Out of the total percentage of outlays for irrigation, the major and medium irrigation project gets three-fourths of the allocation. The minor irrigation and the panchayati raj gets the rest of the onefourths allocated fund. Of this, 80 per cent goes as salary and administration work. The amount that gets involved in the actual work for the tank stands at 1-2 per cent. "The local waterbodies below 41 ha ayacuts should also be entrusted to the panchayats. New wua's under these will be useless as they are too small but the panchayats can organise and maintain the tanks without professional help," says Uma. The village of Gaur, Nizamabad, however, tells a story. Two tanks with total tank area of around 53 hectares have not been desilted in spite of the villagers' appeals. Yella Reddy, the village sarpanch expresses their anguish, "We have appealed to the irrigation department two times since last year to take up the work of desiltation of the tanks as these tanks are their sole source of agriculture, but the department people told us that there is no fund to renovate the tanks." The silt has accumulated on the feeder channel of the upper tank which is stopping the flow of water to the lower tank. The resultant is the flooding of the kutcha village roads. The village does not have a link road to the state highway and now, the panchayat is constructing a pucca road on their own. Yella Reddy also says that if the tanks were under the panchayat instead of government department, then the village panchayat could have taken responsibility of the tanks, but now they cannot, for it is illegal under government law. This type of neglect is possible. Monsoon started in mid-June, so it was late for desiltation but the programme was implemented in May, then it could have been taken up but the Neeru Meeru officials came to the village three times to repeat that there is no budget. In many places like Ballamntary village of Nizamabad district, the feeder channels are blocked and not work has been carried out. In the case of Gaur also, there are two tanks, but the supply channel from one tank to the other has vanished due to no care being taken. "What is the point of desilting of tanks, if the supply channels are not in order and water does not flow into the tank? Desiltation programme should include supply channel cleaning too," says Uma Shankari. Innumerable committees have been formed at every level, leaving the common person confused. M S Kodarkar, zoologist with the Vivek Vardhini College in Hyderabad, who has a special interest in lakes and waterbodies, says, "There are already multiple government departments which are controlling one single aspect: water. There is the metro water supply department, the irrigation department and now various WUAs are sprouting all over. Various authorities control different aspects of water right from supply to treatment of water to its use. There are a number of laws. Creating one more authority, in this case the WCM, the administrative structure has become vague." The project funds are handled by WUAs, and there are allegations of corruption in this area. While it is very difficult to prove how it is done, a government official, speaking on condition of anonymity, revealed how funds are swindled. "I can personally tell you what has happened in a particular case. A watershed committee president received some Rs 7,000. When I enquired about the source, he told me that he received it for signing a cheque for Rs 28,000." Such stories are quite common. The WUA president is responsible for signing cheques to release money to contractors. Even when half the work is done, the contractors claim the money for the work in connivance with the WUA president, who gets a cut. The projects suffer extensively due to this. "A lot of corruption is going on, though no one comes forward to point it out," says Rukmini Rao of the Deccan Development Society, Hyderabad, who is working on watershed projects in Rayalaseema district. "Small NGOs are forced to give money. After the work has been taken up with the community, the government funds do not reach and these NGOs have to bribe to get the money released. It could be as small an amount as Rs 2,000-5,000." This was reflected in Mahabubnagar, where a handful of elite farmers formed a watershed committee which released all the goodies to their relatives. One beneficiary got Rs 72,000 for horticulture. Clearly, the distribution is biased against the landless as well as people from the schedule castes. When asked about what they received, they say most have not even been called for work. Those who were called for work had their wages deducted and contributed to the fund as part of the 10 per cent contribution to the wua fund. The wage employment aspect of watershed-related works suffered tremendously. Instead of the schedule of rates, local wage rates were followed. These were discriminatory to women. So, if the schedule of rates in Mahabubnagar is Rs 9 per cubic metre of silt removed, this got reduced to Rs 7. The members demanding a reduction are invariably landholders. "Money from the village development fund is taken for the watershed fund. When government officials come visiting, they are received using the watershed funds. They have to make a tent for the dignitaries, put a few chairs and give them tea and snacks. All the money comes from the fund. After the rains, tanks have breached. But there are no funds for repair," says Rukmini Rao. The watershed fund is there, but cannot be used for a period of four years due to a faulty policy. While the Neeru Meeru programme clearly lays down the importance of keeping contractors at bay, this has not been the case. "Because of the contractors, the money has been involved more than the people. There is a vast humanpower in the villages. People could have gained employment if the private contractors were not involved," says B N Chetty, who works on vss watershed development with Jan Vikas Sangh in Kurnool district. Poclains have been used on a large-scale to desilt tanks. People commonly point out that the poclain contractors are connected to political parties. "They immediately put the poclains to work and the money goes to the political boss and the work is not executed properly," alleges Ramakrishna Reddy. "The problem of migration could have been addressed if the local villagers had been employed," says Ramesh Reddy, head of the department of civil engineering at the Osmania University. Rajendra Singh, secretary Alwar-based Tarun Bharat Sangh, which has transformed the ecology of the Rajasthan district through water harvesting, visited some parts of the state. "AP waterworks are not in accordance with people's vision," he points out. "It is technocratic and work has been done at a very fast pace." The Neeru Meeru programme is fast becoming a problem bigger than the one it was meant to solve. It is clear that the crash programme won't take the state anywhere. It is of utmost importance that the government does a serious review of the programme and looks into all the irregularities. The current approach is to become technology-friendly and contractor-friendly. The only group to which it is unfriendly is the poor and the downtrodden, for whom the programme was formulated in the first place.